Ultrasound, sonohysterography (SHG), magnetic resonance imaging, computed tomography (CT), and 18-2-fluorodeoxy-2-deoxy-D-glucose fusion positron emission tomography CT (FDG-PET CT) are tools available for diagnosis, treatment planning, and detection of recurrences post-primary therapy of EC. 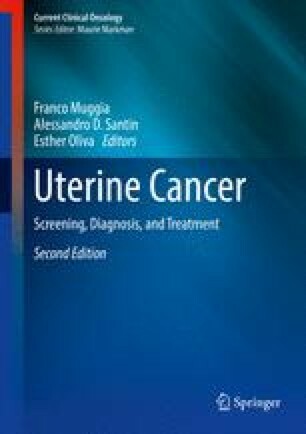 Transvaginal ultrasound has an established role in screening for cancer in women presenting with postmenopausal bleeding. Sonohysterography allows for diagnosis of focal endocavitary lesions and hysteroscopy planning. For treatment planning, magnetic resonance imaging (MRI) provides the best definition of tumor extent in the central soft tissue pelvis whereas FDG-PET CT is the most accurate modality for detecting lymphadenopathy and distant metastases. Post-primary therapy, CT and FDG-PET CT are both useful in evaluating recurrences with the latter being more sensitive.